Lower Saxony (German: Niedersachsen) ies in north-western Germany and is second in area and fourth in population among the sixteen states of Germany. In rural areas Northern Low Saxon, a dialect of Low German, is still spoken, but the number of speakers is declining. Lower Saxony borders on (from north and clockwise) the North Sea, the states of Schleswig-Holstein, Hamburg, Mecklenburg-Vorpommern, Brandenburg, Saxony-Anhalt, Thuringia, Hesse and North Rhine-Westphalia, and the Kingdom of the Netherlands. 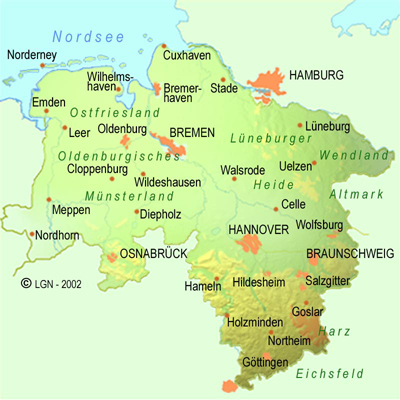 In total, Lower Saxony borders more neighboring states than any other federal state. The state of Bremen forms two enclaves within Lower Saxony, one being the city of Bremen, the other its seaport city of Bremerhaven. The state's principal cities include Hanover, Braunschweig, Lüneburg, Osnabrück, Oldenburg, and Göttingen. The northwestern portion of Lower Saxony is a part of Frisia; it is called Ostfriesland (East Frisia) and lies on the coast of the North Sea. It includes seven islands, known as the East Frisian Islands. In the extreme west of Lower Saxony is the Emsland, a traditionally poor and sparsely populated area, once dominated by inaccessible swamps. The northern half of Lower Saxony, also known as the North German Plains, is almost invariably flat except for the gentle hills around the Bremen geestland. Towards the south and southwest lie the northern parts of the German Central Highlands, the Weserbergland (Weser mountain range) and the Harz mountains. Between these two lies the Lower Saxon Hill Country, a range of minor elevations. Lower Saxony's major cities and economic centres are mainly situated in its central and southern parts, namely Hanover, Braunschweig, Osnabrück, Wolfsburg, Salzgitter, Hildesheim and Göttingen. 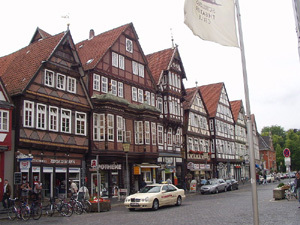 Oldenburg, near the northwestern coastline, is another economic center. The region in the northeast is called Lüneburger Heide (Lüneburg Heath), the largest heathland area of Germany and in medieval times wealthy due to salt mining and salt trade, as well as to a lesser degree the exploitation of its peat bogs up until about the 1960s. To the north, the Elbe river separates Lower Saxony from Hamburg, Schleswig-Holstein, Mecklenburg-Western Pomerania and Brandenburg. The banks just south of the Elbe are known as Altes Land (Old Country). Due to its gentle local climate and fertile soil it is the state's largest area of fruit farming, its chief produce being apples. 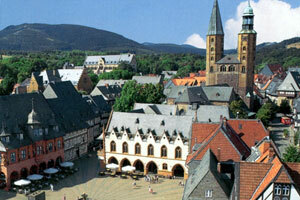 Goslar is located at the northern edge of the nature park Harz and has 46.000 inhabitants. The medieval old town with the emperor imperial palace and the ore mine Rammelsberg, the only one that operated more than 100 years which closed in 1988, have been included in the UNESCO list of “culture- and natural heritage of mankind” since 1992. It is one of the places where the occident’s history began. Many landmarks of a great European past remained mostly unscathed in this city. Two thirds of all buildings in the old town are protected by the care of monuments. Many narrow still cobblestone paved lanes in the old town are an adventure. Every house tells its own story. But this city is no museum. It is livened up by 9.000 people and a strong retail. You find all this on only one square kilometre. We look forward to your visit. Hameln is located between the wooded ridges at the Weser. Hameln is, because of its economical and touristic importance, the heart of the Weserbergland. The Rat Catcher came to the city in 1284. Everybody knows the world known legend whichs’ historical backround could not even be clarified today. The Rat Catchers story is performed by 80 actors on an open air stage every Sunday at 12 o’clock from the middle of May until the middle of September. But not only the play is center of attraction. Hameln has a beautiful historical old town. Especially marvellous are the old buildings from the renaissance, which can only be admired here in such a numerous appearance. The pedestrian precinct combines modern shopping areas with historical monuments. Be astonished by Hamelns’ Glasshut or just enjoy shipping on the Weser. Celle is a town and capital of the district of Celle, in Lower Saxony, Germany. The town is situated on the banks of the River Aller, a tributary of the Weser and has a population of about 71,000. Celle is the southern gateway to the Lüneburg Heath, has a castle (Schloss Celle) built in the renaissance and baroque style and a picturesque old town centre (the Altstadt) with over 400 timber-framed houses, making Celle one of the most remarkable members of the German Framework Road. From 1378 to 1705, Celle was the official residence of the Lüneburg branch of the Dukes of Welf who had been banished from their original ducal seat by its townsfolk. The buildings in Celle’s old town centre date back to the 16th century, among them numerous (and some 480 restored) half-timber houses, making Celle an important city for tourism in the southern Lüneburg Heath region. 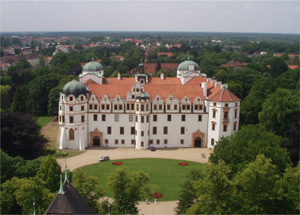 The most impressive building is the ducal palace, Schloss Celle, which was built in 1530 at the site of the former castle. Another major attraction is the Stadtkirche (town church, 1308) with its white tower, from where the town trumpeter blows a fanfare twice a day (an old tradition that was revived as a tourist attraction). Celle has a synagogue built in 1740, one of the few that survived the Nazi pogrom night of 1938, thanks to its location in a narrow street of wooden half-timber houses next to an important leather factory that would have been collaterally damaged. During World War II, the Bergen-Belsen concentration camp, where Anne Frank died, was located near Celle; today, a memorial and exhibition centre mark the camp site. Celle, Germany's "Rothenburg of the North" was voted Germany's most beautiful town.